Tonight I bottled my von Meyer Weizen; it had been in the fermenter for 3 weeks. This was a touch longer than originally intended, following various unexpected interruptions. The final gravity was 1.012, down from 1.047. This works out to 4.6% abv. The beer has the prominent banana and clove aroma/flavor that’s expected with this style–I shall be curious to see how these mellow and taste after a little aging and at proper serving temperature under carbonation. I primed the beer with 2.6 oz. of corn sugar boiled in 2 cups of water, targeting 2.7 volumes of CO2. My final yield was 6 12-oz. bottles, 12 18-oz. bottles, and 3 22-oz. bottles. 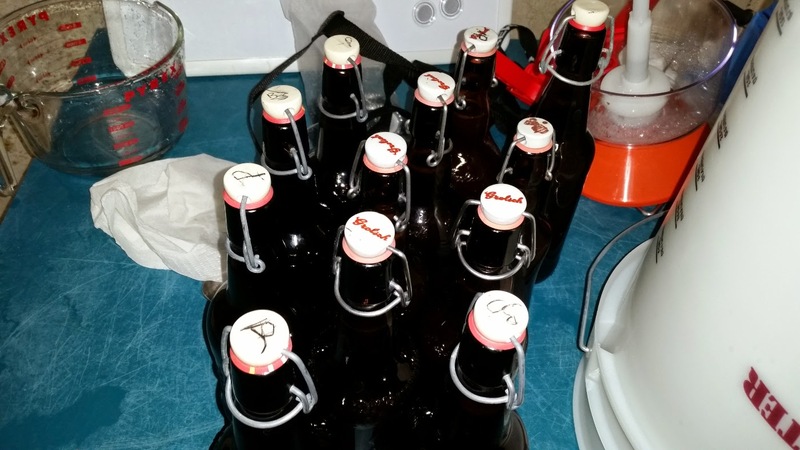 This entry was posted in bottling, wheat beer and tagged VMW, von Meyer Weizen. Bookmark the permalink.